Stellar Jeevan is the new residential project launched by the Stellar Group at prime Location of Sector 1, Noida Extension Greater Noida. 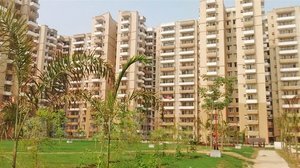 It Offers 2/3/4 Bhk Ready to move Flats/Apartments in Noida Extension with Modern comforts and conveniences which include a swimming pool, a state of the art gymnasium, a club house, Wi-Fi connectivity, multi-tier security surveillance and a sports facility at affordable Price. The apartments at Stellar Jeevan Sector 1 Noida Extension are 3 sides open for the patrons. There are several amenities available for the patrons which includes CCTV security gate, Piped gas supply and 24 hours water supply. This destination is spreads over 18 acres which is almost 75 % greens and the rest are residential towers and common areas.